Flooring design tips and ideas to create a contemporary office space. Office flooring needs to look fantastic to create a good first impression with visitors and to boost staff morale, while remaining durable, hardwearing and easy to maintain. 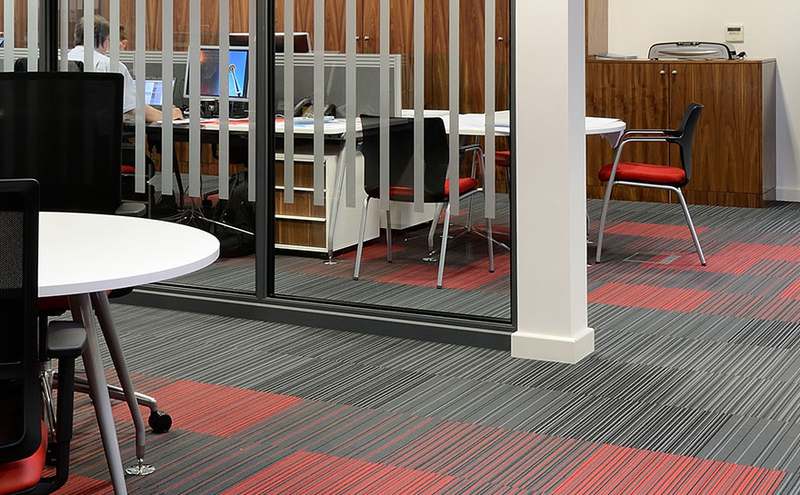 For over 50 years, Stebro Flooring have specialised in the supply and installation of commercial office floor coverings including: carpet tiles, vinyl flooring and entrance matting. Flooring has an important part to play in the design of a new workspace. Whether you are looking to completely redesign your workspace, moving into new premises or just looking to change your flooring, we will work with you to ensure we create the perfect flooring space for you. Where you work clearly matters: The design of the office can impact on employees’ performance, mood, efficiency and sense of well being, employees are happier in a more positive environment. Aim to create workspaces that allow for concentration, encourage collaboration, inspire creativity and improve productivity. Using flooring to create different workspace areas within one office space gives great flexibility and can improve your companies’ structure. We suggest using varying colour schemes across the floors to designate certain areas for different tasks. This ensures that employees have the choice to work in a way that suits the task. Having areas in the workspace that employees can use to take a break from their desk is crucial to their well being and productivity. This gives employees a space to recharge and relax as well as a casual area to collaborate and brainstorm ideas. The open plan workspace is the main area that is used daily. It needs to accommodate lone working while allowing for communication between employees. Collaboration comes more naturally in an open plan workspace, fostering a team spirit. Along with the collaborative open space it is also important to provide quiet zones. This area should enable employees to work alone for prolonged periods. Or even to provide a confidential meeting space. A meeting room can leave a strong impression on clients. The best meeting rooms are the ones that express what your company is all about. Whether your style is fun and quirky or traditional you can reflect this easily with your choice of flooring. 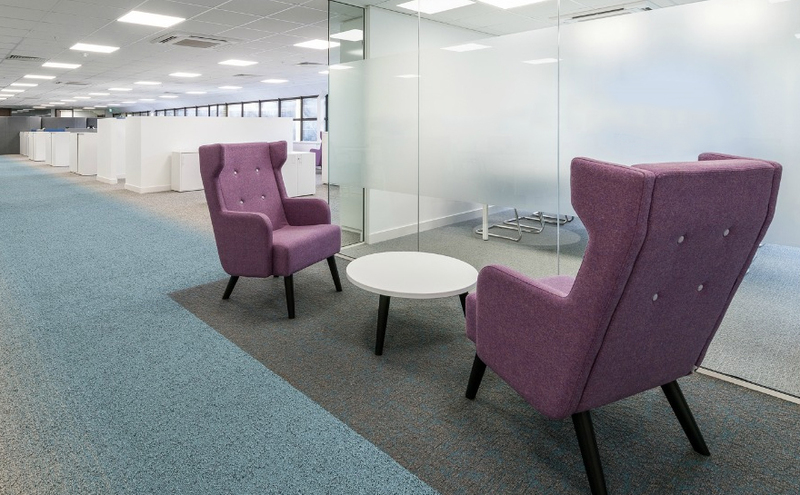 Carpet tiles have excellent acoustic properties, which will help to keep the meeting room quiet as well ensuring privacy. Look to create flexible meeting rooms for both employees and visitors, which can be used for an impromptu meeting or a welcoming professional space to receive a client. The flexibility of these spaces is where their value lies. The modern workplace is now a place to collaborate and exchange ideas rather than just “get the job done”. The best companies are investing in their workplaces to promote wellbeing and productivity all round. 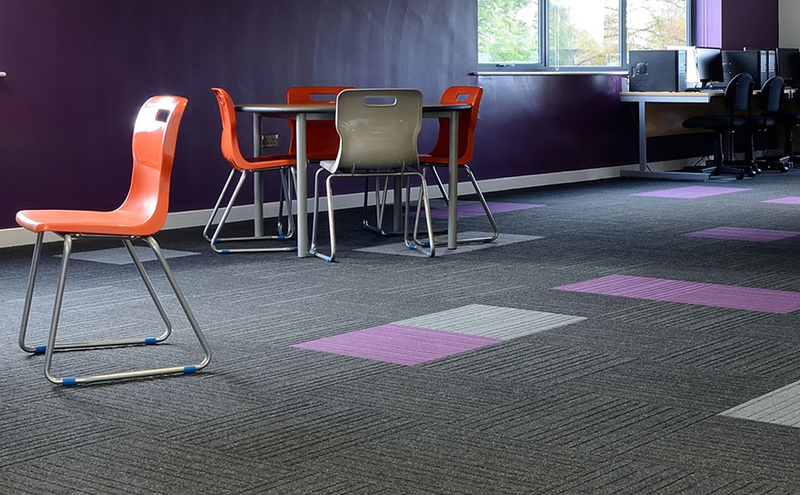 Office carpet tiles are affordable and extremely hardwearing making them one of the most popular office floor coverings. 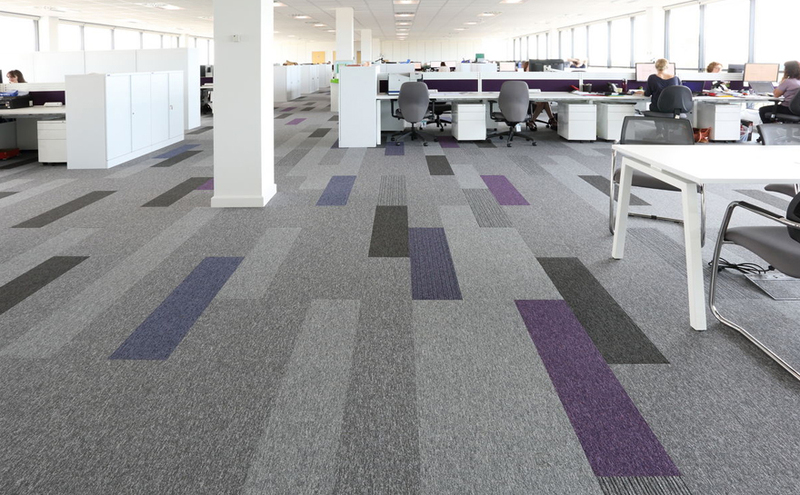 We have an extensive range of commercial carpet tiles from the leading flooring manufacturers, including: Desso, Burmatex, Interface and many more. This ensures you have an extensive choice of colours, textures and patterns for your office flooring providing endless possibilities for unique flooring in your workspace. We recommend office carpet tiles for busy noisy office environments due to their excellent acoustic properties. recommended office vinyl flooring products have a robust protective layer added to the surface to ensure they are extremely durable. Vinyl flooring is the perfect choice for your office flooring, reception areas, boardrooms, meeting rooms and washrooms. Entrance matting is the gateway to your office and in busy commercial offices will receive very heavy footfall. We can supply and install a wide range of specialist entrance matting for your office, which provides an appealing surface in doorways that is easy to clean and maintain. Choose Stebro Flooring for your office flooring and be assured that the installation of your new floor will be completed by specialists with over 50 years experience in the office flooring industry. We will work with you to personalise your workspace to suit your needs. We’re also accustomed to working outside normal hours to reduce disruption to your business and will go the extra mile to ensure your floor is finished to schedule. No matter the size of your project, advice is free, so give us a call and we’ll talk you through your options. If you’d prefer to get in touch via email or using the contact form, then we’d be delighted to hear from you. Call us on 0121 559 0544 or get in touch by email.